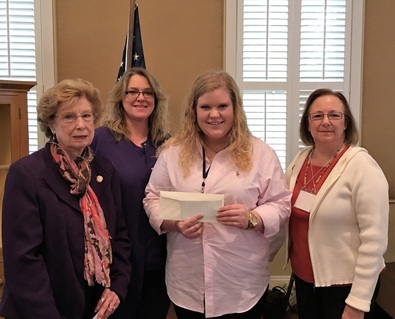 Louise Spizale Horticulture Scholarship Award - Covington Garden Club, Inc. The recipient of this year’s award is 17-year-old Abigail Jenkins of Bush, Louisiana. Abigail is a senior at Covington High school, an honor student with a GPA of 4.3. ​Abigail is currently serving as state secretary of the Louisiana FFA. She is a member of 4-H, Student Council, National Honor Society, Louisiana Junior Cattleman’s Association, and the Louisiana Junior Angus Association. Abigail has competed in livestock judging, parliamentary procedure, meat ID, prepared and extemporaneous speaking, Creed speaking, and dairy cattle judging. She participated on the state winning FFA and 4-H livestock judging teams and competed nationally in both. She was honored as the first student from Louisiana 4-H to receive an internship to the North American International Livestock Exposition. Abigail also volunteers in the children’s ministry at her church; and she enjoys mentoring and training younger livestock exhibitors. Abigail plans to attend Mississippi State College in the fall to pursue a degree in Animal Science with a concentration in Animal Husbandry and Genetics. Congratulations Abigail and best wishes for a bright future!